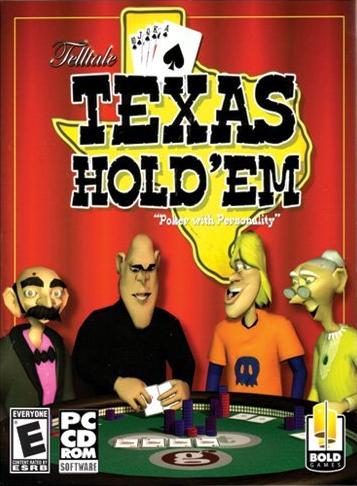 Telltale Texas Hold'em, the first game by Telltale Games, was released on February 11, 2005. It demonstrated both the Telltale Tool, which is Telltale's engine that runs all of their games, and their digital distribution system (which, at the time, was referred to as "Telltale Now"). It's not just a shiny proof-of-concept though, as it is a pretty fun game of poker. You play in the third person at a poker table, and are simply known as "The Player". You play against four computer-controlled characters, each with their own unique personality. One of the four computer-controlled characters, Boris Krinkle, later becomes a character in Sam & Max Save the World, as the name Harry called him in this game, Leonard Snakechalmer. Telltale Texas Hold'em received a spiritual sequel, Poker Night at the Inventory, in 2010. The retail version of Telltale Texas Hold'em is out of print, but it can still be purchased digitally online through Steam.